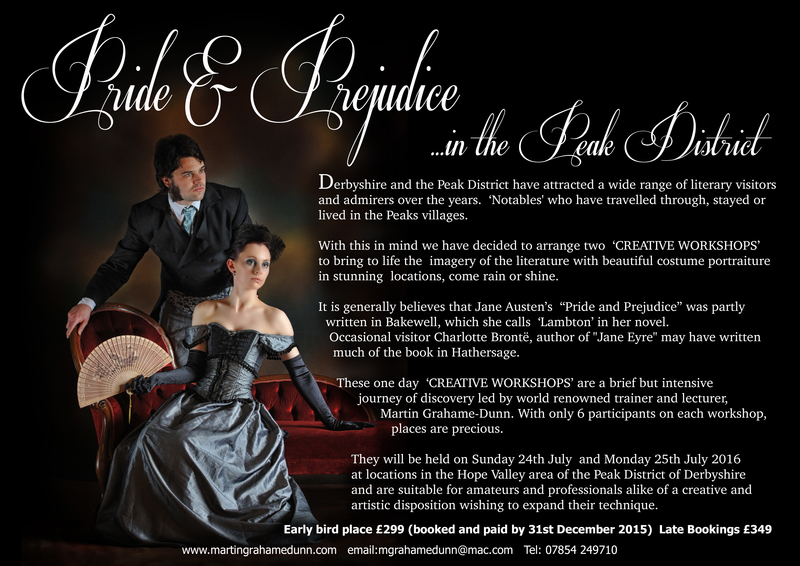 On Sunday 24th and Monday 25th July 2016 I will be holding one day workshops with a literary classics theme inspired by Pride & Prejudice and Jane Eyre in the Hope Valley area of Derbyshire’s Peak District. In essence, costumed environmental portraiture where the mastery of light, posing and composition in a story telling manner will be explored with just six delegates. The days will encompass a briefing, literary themes to inspire the images, shooting sessions, lunch, creative retouching and presentation as well as a wind up group session to discuss the day. Early bird places are only £299 (Booked and paid before 31st December 2015) and include an Album Epoca ‘Event Book’ designed and compiled by Martin Grahame-Dunn containing a selection of images from the day, lighting diagrams and other information. Late bookings will be at the rate of £349. Bookings being taken now with a £100 deposit per person. Contact Martin at mgrahamedunn@mac.com to secure your places.